I'll be gadding about the US for the next three or so weeks, so no new reviews until early August. 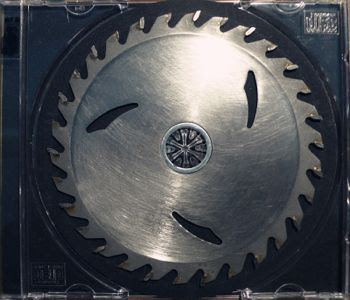 I'm going to go out on a limb and guess that this isn't the first time, in world history, that a saw wheel has come packaged in a CD case as an object of contemplation. True, I haven't heard of any specific example before this but, if you were thinking about more or less circular, flat items to substitute for an audio disc, such a thing could well have sprung to mind. It's very attractive, after all, burnished steel, in this instance bearing four incisions (mine has four; the above, three) and two shade tones. It connotes sound, a fairly specific, high volume sound that can, in my experience, hover on that fine line between excruciating and divine, inhabiting an area not so far from some noise climes. It implies a kind of violence. It has heft. It feels cool, smooth and somewhat uncomfortable in one's hands. More, Lao Yang has filled the anterior section of the CD case wi a folded rectangle of black sandpaper (rough side exposed front and back) and sandwiched the blade between two discs of same, a half-inch circular hole in their center. There's no printing whatsoever to be found anywhere; all is black or silver. Not quite true--turning over the sandpaper reveals the iterated identification, "P400", the grade of the material, I assume. But there are a couple of other, small, odd things. On my copy (I have no idea if this is the case throughout the run of 50 which, per the website, are not for sale), there are two small, about a centimeter square, placards of thin cardboard. On one, floating loosely inside the case, is a drawing of a man in glasses wearing headphones, his mouth covered by an impossible to identify shape. On the other, slightly larger and wedged between the CD backing and the back of the case, is a pair of workman's or gardening gloves, one laid atop the other. Both drawings have a kind of ideographic quality as though they're abstract representatives of some function or occupation. Perhaps it's someone, and his apparel, who operates a saw. "Half-animals" is how Hochherz describes the creatures he's created here. The uninformed listener may wonder if he's listening to especially clear and pristine field recordings of insect, amphibian and bird life or if it's an entirely electronic construct. I think the latter though I'm not sure the sounds, or some of them, don't have an ultimate genesis in the analog world. 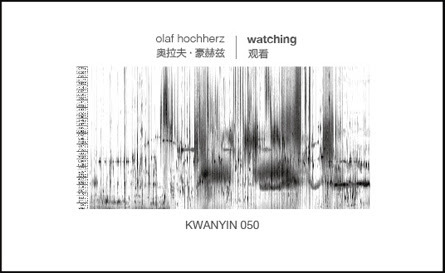 In any case, we're presented with some 42 minutes of these sounds, varying about as much or little as one might encounter near a pond at night, chirruping along at a low level, quite individuated, with the random odd sound or momentary increase in volume. It slips easily into whatever your ambient environment happens to be, unassuming, just slightly alien, a gentle forest of electronic crickets and peepers. Strangely satisfying, somehow more so than many a "real" field recording. When last heard from (by me), only a couple of months back, mssrs. Blechmann and Knapp had produced a work titled "VIII", a lengthy, droning surge that was ok if a bit thin in substance. 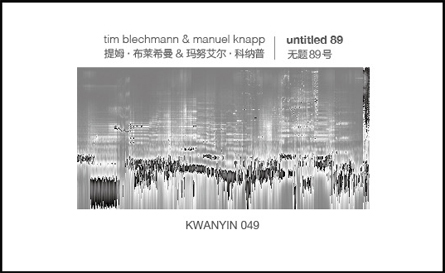 This one has some of that feeling, but more structural variation and more reverberant, vibratory kind of sound. I just happened to have rewatched 'Stalker' for the third time the other evening; not sure if I would have attached a Stalker-ish aspect to this music had I not but, well, you could do worse for comparisons. It's bleakly industrial, a barely functioning factory in the wee hours, sluggishly in motion, lights barely flickering. It combusts now and then, sizzles for a bit, subsides. Blechmann and Knapp do a really good job reining in any potentially showoff-y or spectacular urges, keeping things multiple shades of gray, richly layered. Good job, strong work. Every so often, in this general area, a work appears laden with strong personal emotion not normally associated with such abstract music. 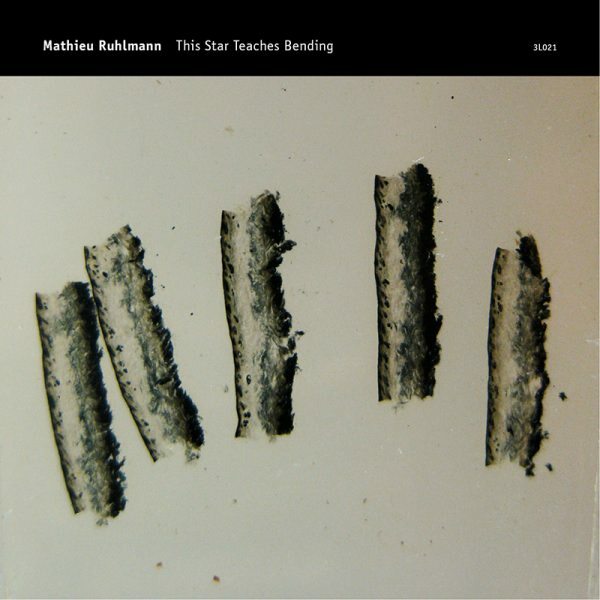 Jason Lescalleet's "The Pilgrim" was once such notable event and Ruhlmann's "This Star Teaches Bending" is another. Hear, a musical document is constructed from the various, often tiny sounds encountered during the treatment of Ruhlmann's mother, who had been diagnosed with a rare and terminal lung condition. He presents five pieces, listing the sources which include an oxygen tank, rubber gloves, room lights, a respirator and, notably, one track whose sounds derive entirely from "amplified stomach fasting for 3 days". How to quantify? If I attempt to listen 'disinterestedly", that is, simply as a sequence of sound, it's an engaging disc, very subtle and subdued, perhaps with an air of menace, very restrained, sounding more or less pretty close to what it is: items and machines operating indoors, machines not desgned for sound emission but emtting nonetheless. Of course, given the stated facts about the nature of the work, it's absurd not to think of the context and, for me, this only serves to strengthen the release. I know some may have trepidation about injecting such emotional content into what's essentially a set of field recordings but, for me, if it's done without sentimentality (or even, at times, with such, as is arguably the case with Lescalleet's daughter singing 'Molly Malone' on his album) I'm fine with it and Ruhlmann is nothing if not unsentimental. There's a clearheadedness here, a real examination of sounds and what, here, they truly mean that's bracing, up to an especially including the stomach sequence. Strong stuff, excellent work. 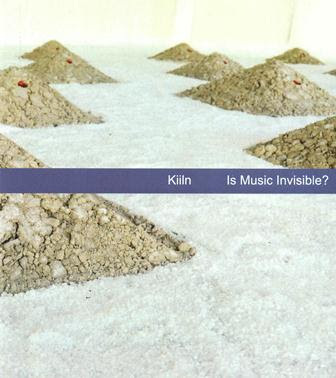 Kiiln consisting of Ruhlmann (ukelin, cymbal, piano, amplified objects) and Lance Austin Olsen (tape players, radio, amplified objects, trainer guitar). A set of five pieces with what I'd have to say is an AMMish tinge, meant in a good way. Spare, with gently grating electronics, discreet radio emergences (sounds like a Barber Essay for Orchestra at one point, maybe not), sound sources that linger a bit then cut off unexpectedly. Almost all on the quiet side but with a very wide textural range in that dynamic spectrum resulting in a fine feeling of variation. This is one of those recordings that, short of describing sounds blow by blow, I'm at something of a loss to try to otherwise encapsulate. It's really strong though, flows beautifully, makes few missteps--everything sounds both fresh and considered, nothing overstaying its welcome. Invisible enough, I daresay. Good stuff, try to give a listen. 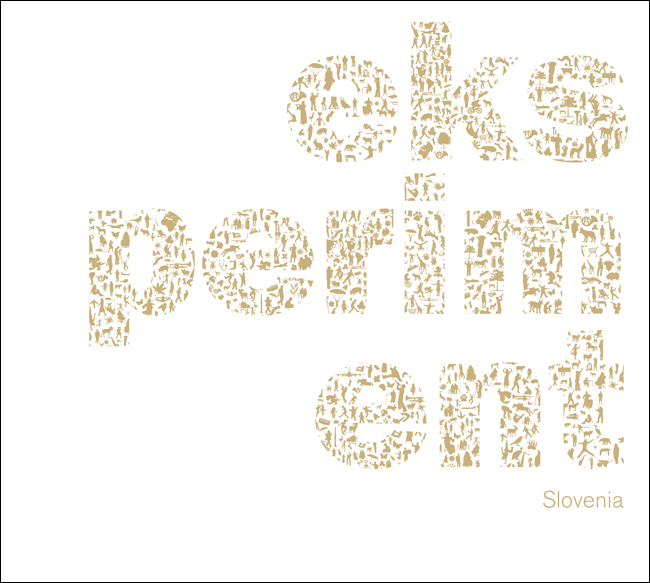 A compilation of contemporary trends in Slovenia, thirteen tracks by musicians largely unknown to me, excepting Tomaž Grom, Michel Doneda, Jonas Kocher (all on one track, plus Grom appears on a separate solo performance and in a trio), Miha Ciglar and Seijiro Murayama (not Slovenian but peripatetic). Unsurprisingly, the cuts are wide-ranging in both approach and quality. The piece with Grom, Doneda, Kocher and Tao G. Vrhovec Sambolec (on computer) is a performance remixed by Giuseppe Ielasi and, as such, is an engaging, bumpy ride with shifting, prismatic coloration, very active, rambunctious and exciting. Marko Karlovčec offers an intriguing alto improvisation, rattling and humming in a rather unique manner, with the inclusion of, if not a large fly, a damn good imitation of one. My favorite discovery on this disc is the composer Bojana Šaljić Podešva, whose "Meditation on Closeness", for magnetic tape and accordion (Luka Juhart) is a wonderful mass of quivering energy--want to hear more! Grom's solo is strong of its type; not up my alley but those who enjoy the Guy/Leandre axis will certainly dig. Vanilla Riot's music is better than its name, sounding like Blind Idiot God on meth. Sambolec's "Caressing the Studio (Bed, Table, Window, Chair) sounds like just that, its billowy rustles very attractive and absorbing. Other cuts are more run of the mill, though there's nothing aggressively bad here. Worth checking out if the above intrigues you and someone give me a line on Podešva's other available work.